As with other fantasy games like Harry Potter…Chronicles of Narnia…etc. etc., you must use certain characters to complete certain level areas. Plays as Jared, Simon, Mallory Grace and even small Thimbletack the Brownie throughout the chapter quests. Optional side quests are also available. Arthur Spiderwick’s “Field Guide to the Fantastical World Around You” offers available help at any time (+ button). The guide also gives hints for your next task while providing background, interesting trivia and options/abilities. The game has a good mix of puzzles and collection activities as well. Collect from ten types of faeries/sprites then keep up to three at a time. Get your creative juices flowing a bit by painting each sprite when you nab each one to record them in the guide. You can go back to capture free sprites, found in the same spot. Catching several of the same kind boosts their power. Observant players (plus players who have read the book) can take quicker advantage of the items quickly while keeping others in mind for future use, though you can get stuck at times (e.g. finding the broomstick in the beginning turned into a bit of a chore for this reviewer). This game provides a nice bonus by allowing unlimited character switching once you complete the game. Other bonuses, including a competitive multiplayer mode, and unlockables reward you along the way too. 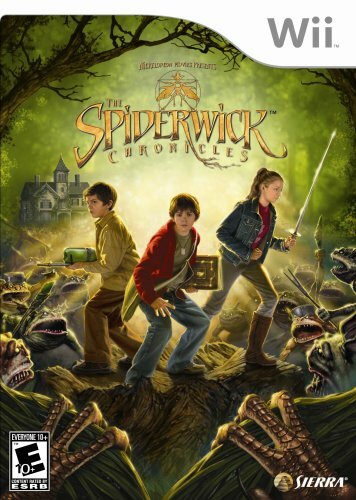 Based on the Paramount Pictures/Nickelodeon Films’ movie adaptation of the book series of the same name. Well schooled players can conquer this highly recommended (***1/2 out of four stars) game quickly, but even without extensive knowledge (though cut scenes provide some background), most players can finish the game without hitting double digit hours, so the unlockables and multiplayer mode helps boost the decent replay value. Options for possible future installments could include designing your own sprite then sharing online plus participating in International Sprite League tournaments. This entry was posted in Video Game Reviews and tagged Michael Siebenaler, Mike Siebenaler, Spiderwick Chronicles, Tall Writer, video games, Wii. Bookmark the permalink.